Beneath the surface of Twitter – and frequently bursting up into view – are the armies of spam bots and zombie accounts. Use any one of the many follower analysis tools out there you and you’ll quickly discover that many seemingly massive names on the social network have followings inflated by fakers. While there are already lots of ways to see how real your followers are, here’s a ridiculously simple little experimental service that makes it possible to simply tweet someone’s @name at a friendly Twitter bot and get analysis back. @brokenbottleboy about 66.38% of their followers are active (MAUs), and about 47.43% are quality active users. 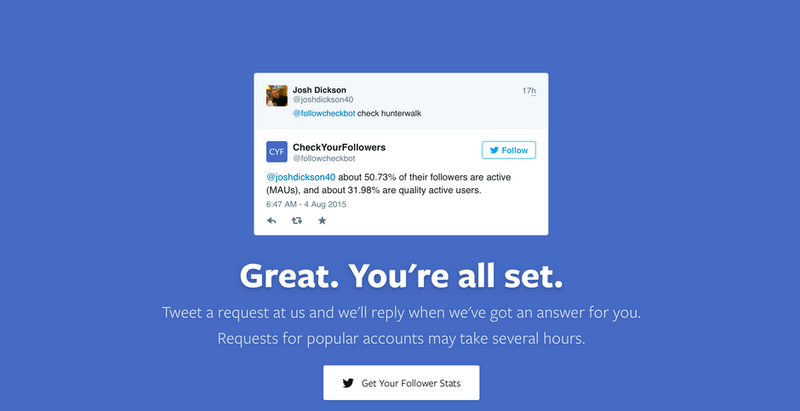 Josh Dickson, the founder of content management system Syrah, built @FollowCheckBot to scan your followers and deliver details of what percentage are active and what percentage of them are high quality. You can read the full story of how he came to put the project together here, in a comprehensive article fittingly hosted on Syrah. If you want to try the bot, all you have to do is head here, connect it to you Twitter then start @-messaging it with the names of accounts you’re curious about.